Voting can be a confusing process for native English speakers, but for those who don’t speak English, it’s even more daunting, as two immigrant groups pointed out after last week’s primaries. Korean-Americans complained of confusing instructions and a crashed website that hindered their efforts to vote, and South Asians questioned the decision to provide translated ballots this November to Bengali-speakers but not Hindi-speakers. Confusion about changed voting districts and a crashed website resulted in some Korean-American New Yorkers returning home from the polls last week without casting ballots, the Korea Daily reported. 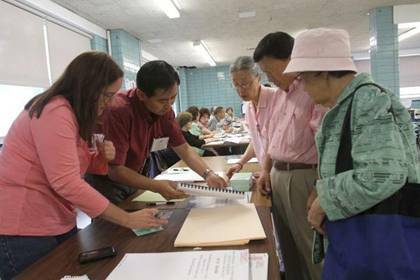 New Jersey Korean-Americans made similar complaints last month about their primary elections. It is assumed that an overload of Korean voters who didn’t get notice of the election tried to connect to the website all at the same time, causing the webpage to crash. Last week the Gotham Gazette reported efforts to provide Queens voters with translators and phone operators fluent in Bengali, Punjabi and Hindi. Under federal mandates, translators, phone operators and signs must be provided to help Indian American voters in South Asian communities such as Jackson Heights and Rosedale. But South Asian voters last week didn’t find ballots printed in any of their languages. They will have to wait until November to see a Bengali-language ballot. Nabi, 21, said the addition of Bengali as a language on the ballot would make a big difference for him. “I would vote now,” he said, as he looked outside the window of his steamy halal cart. Still, the Board of Elections’ decision to print ballots in Bengali — which is spoken in Bangladesh and part of India — instead of Hindi has raised some criticism. … Gurpal Singh, the executive director of SEVA NY, a South Asian organization operating in Richmond Hill, Queens, said the BOE’s commissioners had been “very academic in their approach” by choosing Bengali, rather than taking into account the realities of the neighborhoods themselves.